The 2016 DevOps Enterprise Summit (#DOES16) speakers are taking the stage in less than three weeks and we can hardly stand the anticipation! There is no other event like it – where leaders of large, complex organizations join forces to identify and amplify the latest DevOps trends and best practices. Each year we find ourselves lucky to hear from the best and brightest in the business, as they share their experiences related to DevOps transformation journeys. This year’s speakers will be presenting on a wide variety of topics from culture and the functions of people, to technical infrastructure and tooling. Plus, hear experience reports from enterprises such as Target, SAP, Verizon, Starbucks and many more. The past two years have sold out, and despite the bigger space for DOES16, this year is on track to do the same. Don’t miss out on your chance to attend the show, register now! Luckily, some of the speakers couldn’t wait until November 7 to share their insights. Our founding partner, Electric Cloud is hosting its fourth edition of its live Continuous Discussions (#c9d9) video podcast, dedicating one full hour to a DOES16 preview discussion with several conference speaker. 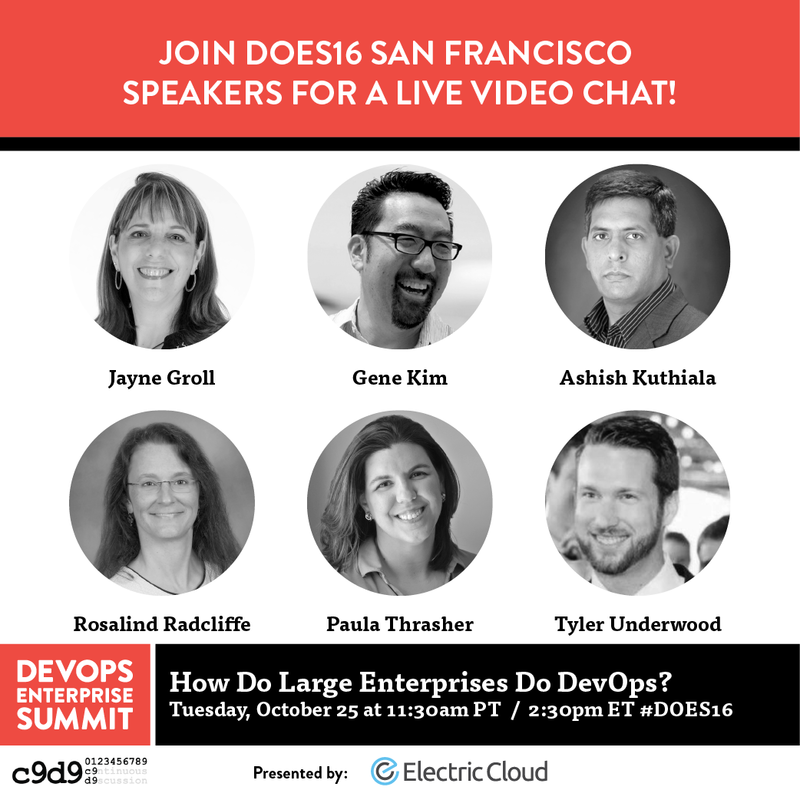 Please be sure to join Gene Kim, Ashish Kuthiala, Jayne Groll, Rosalind Radcliffe, Paula Thrasher, Tyler Underwood and Electric Cloud on Tuesday, October 25, at 11:30am PST. Read on for more background on who we’ll be speaking to next week! Gene is a huge fan of IT operations, and how it can enable developers to maximize throughput of features from “code complete” to “in production” without causing chaos and disruption to the IT environment. He has worked with some of the top Internet companies on improving deployment flow and increasing the rigor around IT operational processes. In 2007, “ComputerWorld” added Gene to the “40 Innovative IT People to Watch, Under the Age of 40” list, and he was named a Computer Science Outstanding Alumnus by Purdue University for achievement and leadership in the profession. Ashish Kuthiala is Sr. Director at Hewlett Packard Enterprise leading Strategy and Marketing for HPE’s DevOps portfolio offerings. Prior to this role, Ashish was VP, Marketing at Electric Cloud, a DevOps automation company, led Product Marketing at AccelOps and spent a decade at HP leading product development, product management, and R&D teams. Previously, Kuthiala was a software developer at ReplayTV (acquired by DIRECTV) and Alltel (acquired by Fidelity Information Services). Born in Buenos Aires, Ashish has a diverse international background having grown up in 7 countries and fluent in multiple languages. Based in Austin, TX, Ashish has an MBA from the Kellogg Graduate School of Management and holds MS and BS degrees in Computer Science and Engineering. Rosalind Radcliffe is an IBM Distinguished Engineer. As Chief Architect for DevOps for Enterprise Systems she is responsible for driving the technical direction of IBM’s products to support DevOps practices. In addition she works with clients on their transformations. Jayne Groll is a co-founder and Board Member of the DevOps Institute (DOI) whose mission is to establish a global learning community focused on emerging DevOps practices. Jayne is also President of ITSM Academy, an ITSM training company. Jayne’s IT career spans over 30 years of senior IT Service Management roles across a wide range of vertical markets including legal, financial, retail and non-profit. Jayne is a frequent presenter at local, national and virtual DevOps, ITSM and Agile events and is the author of the Agile Service Management Guide. Paula is an Application Delivery Lead at CSC. She has over 18 years’ experience in information technology and works in the federal market leading agencies and teams towards Agile and DevOps. Paula’s first Agile project was in 2001, since then she has led over 15 programs and projects as an Agile developer, technical lead, Scrum master, or Agile coach. Tyler has a passion for automating components related to the SDLC (Systems Development Life Cycle) of applications and believes in giving more autonomy and empowerment to developers. He was instrumental in automating the build/deployment process for his previous employer and has carried those same DevOps ideologies and practices to Quicken Loans. While his co-workers will be the first to admit their concern with Tyler’s style choices at times, he believes that full Christmas suits, tiger-style onesie pajamas and jorts are fashion staples. When not sitting behind a computer screen or strategizing about new ideas, you can commonly find Tyler competing as an above-average recreation league athlete. The podcast will be moderated by Electric Cloud’s Anders Wallgren and Sam Fell.